These guys are great migratory birds. Nesting in the northern tier states, we only see them during spring and fall migration. Generally we see them in the weeks leading up to Mother's day, and a week or so afterwards. This year it seems that they came in earlier than usual. 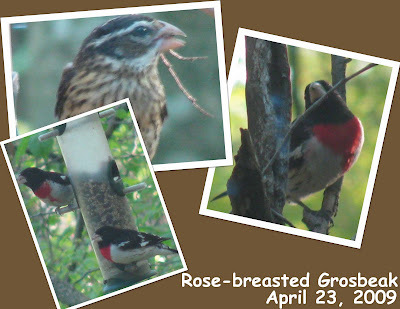 The Male is mostly black and white with the tell tale red breast... the female is far more criptically colored - looking much more like a large female Puple finch. LOVE these birds - they eat LOTS of seed.